Guest sommelier Kelly Prouhl of Double Decanted in Houston is featured in this week's wine review by Houston Chronicle wine writer, Dale Robertson. She really loves our 2010 Napa Valley Cabernet Sauvignon. Thrill the turkey. Save a little Frisson for your cranberry sauce. 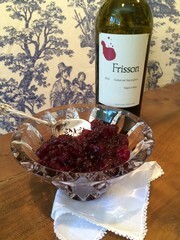 First of all, open a bottle of Frisson 2010 Napa Valley Cabernet, and pour yourself a nice glass. Then, add a cup of wine to a cup and a half of sugar and bring to a boil in a medium saucepan. Once it boils, add a bag (12oz) of cranberries, a teaspoon or two of fresh orange peel ( or about half a teaspoon of dried) and a cinnamon stick. Turn it down, partially cover and watch it while the cranberries burst. This should take all of ten minutes. So easy, and so good. The rest of the Frisson? You know what to do! The cranberry sauce will last about a month, much longer than an open bottle of our beautifully complex, well balanced Frisson Napa Valley Cabernet Sauvignon.